The story of Julian Ritter's life, more often than not, overshadows his accomplishments as a great artist. His was a bigger-than-life persona that propelled his spirit, and allowed him to delve ever deeper into the mysteries of his art. For in his art he perused the mysteries of beauty, of love, and indeed of mortal life and spiritual existence. I welcome input from all those who knew Julian. All the stories add ever more texture to a life well lived. We will seek to know more and to understand his relationships with his women and his lovers. In that, we will look into the least known of all, his one true love, Hilde. We will explore the long, tumultuous affair and relationship with Laurie. 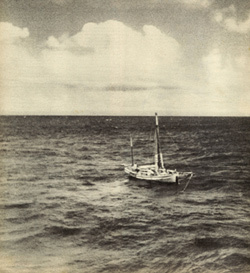 We will find out first-hand what happened on the infamous 'Boat Trip', sailing the South Seas on the Galilee, only to be forlornly cast adrift, lost at sea after a crashing storm. I was a successful Contractor, with a love for art, having dabbled a bit myself in oil painting as a child. I was privileged to meet Julian in Summerland California, in 1983*. Some would say he was crass, and uneducated, that he was rude, and a drunk. All those things may be true. And I Loved him. The female form has been the favorite subject of painters throughout the centuries and present-day artist are no exception. Julian was celebrated for his portrayals of Las Vegas Showgirls and clowns, part reality, part fantasy. Ritter was at work on these in the late 1940's and fifties, creating paintings that were risqué for their era and consequently ideal decor for the various casinos in this racy town. The Silver Slipper Casino (later owned by billionaire Howard Hughes) was one of Julian's best clients. Julian sold 35 paintings to the Silver Slipper over a long career. It is these paintings that now form the core of a collection of Ritter's work, owned by Greg Autry, himself an artist as well as a collector. Ritter befriended Autry who began to collect Ritter's paintings as well as commissioning major works throughout the 1980's. When Autry learned that the Silver Slipper was about to be demolished and the paintings were to be auctioned, he wasted no time in purchasing the entire collection from the Summa Corporation. Julian Ritter was a well known artist and bigger than life personality. 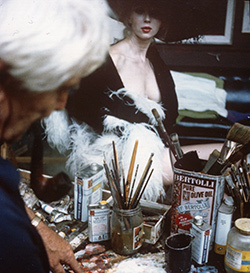 He painted Nudes of Showgirls, "hookers and whores" [his words], and became elite in the Vegas world. After his wife passed away, he set sail from Santa Barbara, on the 45' Galilee, for a lifelong dream of sailing the world. Months later, Broke and in Jail down in Costa Rica, he was bailed out by 17 year old Laurie Kokx from Santa Barbara. Together, they set sail for the South Seas, on what would be a three year journey. After spending time in Tahiti and Bora Bora, Laurie and Julian took on another crewman, Winfried Heiringhoff, and then set sail for Hawaii on their final leg to go home to Santa Barbara. But the seas were rough, and the Galilee and its crew unprepared. Not long after leaving Bora Bora the Galilee ran into trouble. Soon the mast was disabled, the radio and motor out. Then a leak sprung down below. For 89 days the boat was lost. Julian, Laurie and Winfried clung to life. Scraping Algae off the side of the boat. For 59 days there was no food. They weakly hung a sign atop the cabin, `NO FOOD, NO POSITION'. Preying a passing vessel, or plane, or God, would see them, and help. I recently had the opportunity to go to San Francisco, where Julian had a very big presence early in his Career. This subject will be explored in depth in my upcoming new book. 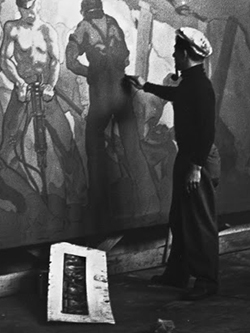 In 1939 Julian was hired to paint Murals for the International Expo in San Francisco. This was an International forum for the City, and be reminded, only 30 years removed from the massive Earthquake that all but destroyed the City. Julian's work at the Expo was very well received, and led to several opportunities that would encompass the next 20 years plus. He was asked, and accepted opportunities to show at many Galleries throughout San Francisco, including most notably the Kotzbeck Gallery and later the Maxwell Gallery on Sutter Street. Not to mention countless others. Early in his career he was showing mostly his pen and ink drawings with watercolor washes. It's easy to assume that these forums also led to acceptance and showing of his work at The Gallery of Modern Art and The Newhouse Gallery in New York City in 1941. Julian Ritter's Painting's always have "sub-text" in the images. Layered with images in the forefront or the background are clowns and depictions of Lucifer, the devil. Sometimes even God himself makes an appearance. Julian liked to say that a beautiful woman makes a clown out of all men. Beautiful women and Clowns were his forte. The concept of the Las Vegas Fantasy came about soon after I met Julian. When he was working on the portrait of my then wife Yvonne, I mentioned to him about doing a commission with lots of Showgirls, and a Clown. We sat together one day bin his studio and he did some quick "study" sketches in Conte. As the concept percolated I became the Clown. I wanted real Showgirls and Julian suggested Janet Boyd should be in the painting. He had painted Janet for her famous full length portrait and many times subsequently. Julian introduced me to Janet, and we began a lifelong friendship. She was invaluable in helping me put together everything needed to make the painting happen. Originally I wanted to bring all the Showgirls to Julian's studio in Summerland, California. Julian wanted all the girls to be there, interacting, at the same time. It soon became apparent, the girls schedules were not going to cooperate. Julian agreed, and we made plans to go to Las Vegas. 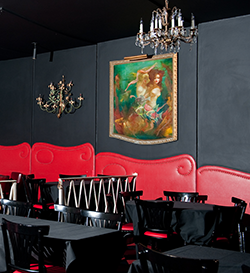 The Showgirl has long been the iconic image of Las Vegas. Emblematic of the unattainable, the fantasy, and the dreams of both men and women worldwide they were swathed in ermine, mink, and sable. They dripped gold lame', diamonds, and crystals, in barely there couture costumes that no mortal woman could dream of wearing. Their allure bespoke a secret known by only a few. They were pampered and toasted, desired and protected. They were the royalty of Las Vegas and all who came to Vegas knew that `The Showgirl’ was the one common thread that kept all the dreams and fantasies alive. Janette (Janet) Boyd was a Las Vegas Showgirl and lead performer for twenty-nine years. She was also a model for world renowned artist, Julian Ritter. I met Janet, through Julian Ritter, when I commissioned Julian to paint what would become his last big Las Vegas Showgirl painting, `The Las Vegas Fantasy.' 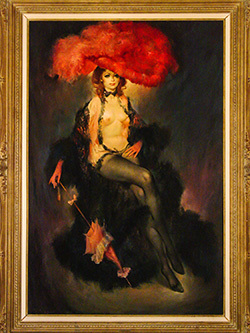 Julian had garnered worldwide attention for the Silver Slipper Collection of paintings which hung at the old Silver Slipper Casino, owned by Howard Hughes. I had breakfast with Janet, and her husband Larry Williams at Cafe Bellagio, in the Bellagio Hotel, Las Vegas. Janet explained to me that the cafe is located on the grounds of the old Dunes Hotel, almost right where the stage had been. It was the very stage where she performed in `Casino de Paris.’ It is, Janet remarked, "Sacred Ground.” I enjoyed breakfast as Janet recounted some of her storied career. In 1939 the Golden Gate International Exposition opened on February 18th, on a manmade mudflat island in San Francisco Bay, called Treasure Island. The `Theme’ of the overall Fair was “Pageant of the Pacific.” It would come to be called “The Magic City,” and lasted for only two seasons. The Great Expo was intended to celebrate the opening of the recently completed, Golden Gate Bridge and The Bay Bridge, which were to bring great revelations to San Francisco. The Buildings of the Expo were monumental, reminiscent of the `White City’ of Chicago’s World Fair held in 1893. At night the building were lit in multi-colors and could be seen a hundred miles away. In the 1930’s, the `WPA' (Works Progress Administration), or the `Second New Deal’ would also act to provide jobs to the great many unemployed workers throughout the Country. The `Federal Project Number One’ employed artists, writers, musicians, actors, and directors from around the country, instituted with the intent of getting America back on the road to financial well-being after a decade of suffering the greatest financial Depression in the country’s history. The WPA would interact with State and local agencies nationwide, to implement large Arts Programs. Applications from artists were received in the thousands, from around the country.